Copy all database file in database folder in CD to a database folder in the database server either local or remote in another computer (or data set devise) of the network. Remove the read only attribute of all the database files, right click on file name and select (properties), then remove the mark on (read only attribute) and click OK button. 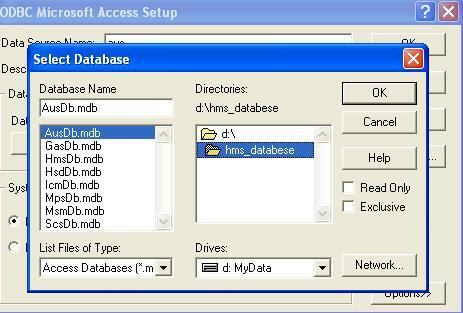 Databases are designed with Microsoft Access Engine. The user may convert the database files to any other relational database like SQL, ORACLE, MySql, ... etc. taking into consideration any modifaction required like for example the date fields must be long dates that include the date and time. 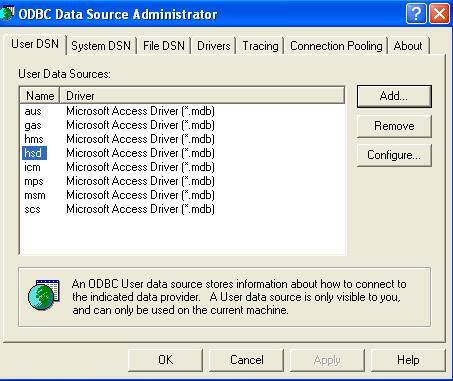 Define Data Sourcefor each database file using ODBC Data Source Manager. The data source name must be the first three letters in the database file name. For example the data source name of the file AusDb.mdb must be (aus), and the file HmsDb.mdb must be hms, ... etc. In control pannel open (open sources (ODBC: Open Database Conectivity) amdinistrator) in administrative tools. Select users DSN (Data Source Name) tab and click ADD button. Select Microsoft Access Driver (*.mdb) and click finish. 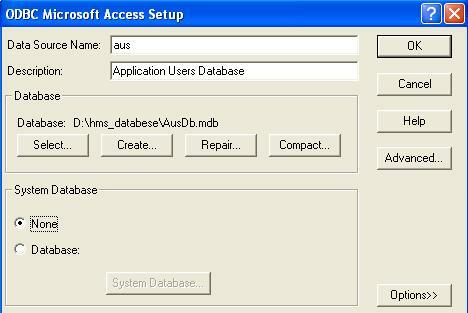 Type Data Sorce Name as specified in the table above (example aus for AusDb.mdb), type description (optional field), and select the database file from the database directory then click OK.
Repeat the above steps for all the 8 databases. If AUS (Applications' Users system) module is not installed in any computer in the network, install it by running the program (aussetup.exe) in aus folder of the CD. If the module GAS (General Accounting System) is not installed in any computer of the network, install it by running the program (gassetup.exe) in the GAS folder of the CD. Also you have to define deferrent Credit Cards if you are going to use Credit Card Payment Method for bills. If the module ICM (Item Catalog) is not installed in any computer of the network install it by running the program (icmsetup.exe) in ICM folder of the CD. If the module HBD (Hotel Basic Data) is not installed in any computer of the network install it by running the program (hbdsetup.exe) in HBD folder of the CD. You have define room types and rooms, outlets and outlet items, taxes, ... etc. If the Hotel basic data, like taxes, room types, rooms, ... etc. are not defined yet, define them using HBD module before using HFO module. Run the program (hfosetup.exe) in the modules folder. This program will install the module into a fixed drive in the computer. A user of type adminstrator must run the program HFO for the first time. In this run a registration form opened to enter the registration data like Hotel name and Adminstrator name and password. Administrator must define other non adminstrator users using AUS module and define their authorizations. If the company profile is not defined, the adminstrator may also define it in AUS module. Company profile contains data such as logo, address, and others that will printed in bills. Adminstrator must run HFO program in adminstration mode to define start and end hours of the hotel day, select printers for reports, define front office cash book, and any adminstrative data that might be used by the regular operator. 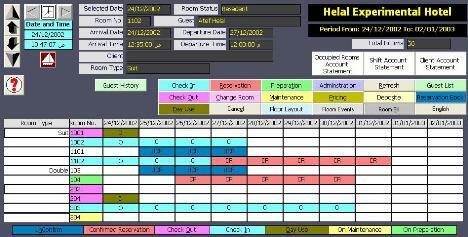 The regular Front Office clerk can now use the HFO program to perform the regular front office functions.